Supports converting complete data from PST files into MBOX file format. Free demonstration facility is provided as well. The application supports converting emails from PST files into MBOX files. All the email applications supporting MBOX files are supported by the application thus need not to worry at any point. It works with email clients such as Eudora, Pocomail, Netscape, Windows Live Mail, OperaMail, Mozilla Mail, Evolution, Sylpheed, Cone, Mutt, Gnu Mail Windows Mail and etc. Software understands curiosity level of users and this is the reason it provides Preview option. According to this, users can view the files prior migrating data from one end to the other. You can view the intended emails as all will be displayed of the selected message. Sysessential for PST to MBOX supports working with all the Windows OS editions such as Vista, Win 7, Win XP, 10, 8.1, and several others. This gives ultra ease to Windows because while installing the application they hardly required think of the specific editions. The application offers complete solution for executing complete email migration from one end to the other. It supports converting emails from PST file format into .mbx file format. It supports for migrating complete metadata into as well thus data gets converted along with all relevant details. 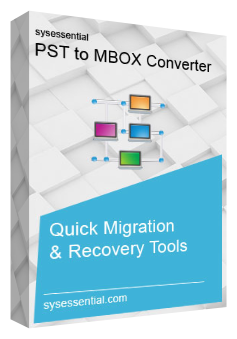 Quickness does matter for professionals and this is the reason, when users feel the need for migrating emails from PST file format into MBOX they consider Sysessential for PST to MBOX. There is surety for migrating bulk email data from one end to the other in a speedy and convenient manner. One of the interesting features of the software is its support for saving converted emails into desired location. This means that as soon as PST files get migrated to MBOX, users can choose the desired file format and commence email saving. This will facilitate users to make a better choice when it comes to user-friendliness and flexibility. Another cherishing moment with the application is ease for all Outlook users. Software is compatible working with all Outlook editions such as Outlook 2010, 2007, 2003, 2016 etc. What is the exact process to import MBOX files in Mozilla Thunderbird? First of all start Thunderbird. What is the right process to import MBOX file in SeaMonkey on diverse MS® Windows platforms? After getting the location, start SeaMonkey. Then go to Menubar and press ‘Window’, and after that choose ‘Mail & Newsgroups’. You can also choose ‘Mail & Newsgroups’ available towards the left side and then go to statusbar. You will come across a new window and seek the converted emails under ‘Local Folders’. What are the steps of migrating MBOX files into Spicebird onto various Windows platforms? What is the exact process to import MBOX files in Netscape on various Windows platforms? Press ‘Window’ and then select Mail & Newsgroups. Navigate the statusbar and press 'Mail & Newsgroups' available towards the left. Is it possible to converted intended emails into MBOX file format? Yes, the possibility is quite high. You can migrate complete email database or else migrate only few selected emails as well. Trust me, you will not find any better experience than Sysessential for PST to MBOX. This application supports migrating bulk email data from one end to the other safely. I found my emails in a systematic ad ordered way. This makes ease when I access emails in Netscape, Pocomail and so on. You can also use the application and migrate emails systematically. Email migration is always a challenging task. There are some situations where I used manual methods but badly failed. When I got into the need to migrate emails from PST into MBOX then I used Sysessential for PST to MBOX and this resulted so well. I am able to access emails absolutely comfortably.